While it is common to hear an argument postulated by adherents of a recent pro-Biafra agitation resurgence among young listeners of a pirate radio station operating out of the United Kingdom, Radio Biafra, that “Biafra” was the initial name of the territory to which the South of Nigeria belonged, our checks have failed to substantiate this claim. The idea has been pushed by the Radio station run by a rather radical individual, Nwannekaenyi Kenny Okwu-Kanu, who goes by the alias, Nnamdi Kanu. 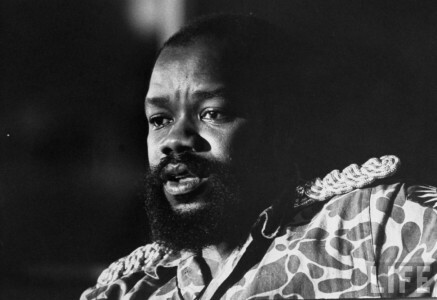 Apparently the name “Biafra” or “Biafara” was picked again because the former Premiere of Nigeria’s then Eastern region, Odumegwu Ojukwu had chosen the “Biafra” name for the territory he wished to preside over; however there is no evidence that Ojukwu selected that name because he believed it was the name of his ancestral home. Rather it was the name of much of Cameroon, Equatorial Guinea and São Tomé and Príncipe and perhaps a nice name that tickled Ojukwu’s fancy. 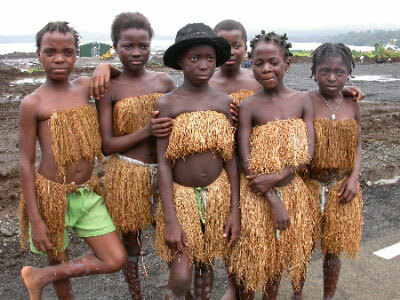 Or perhaps Ojukwu was suggesting an ancestral origin outside Nigeria in the Equatorial Guinea, Cameroon region. The maps can be seen on the Princeton University website and enlarged to examine. We have brought out the relative parts below. 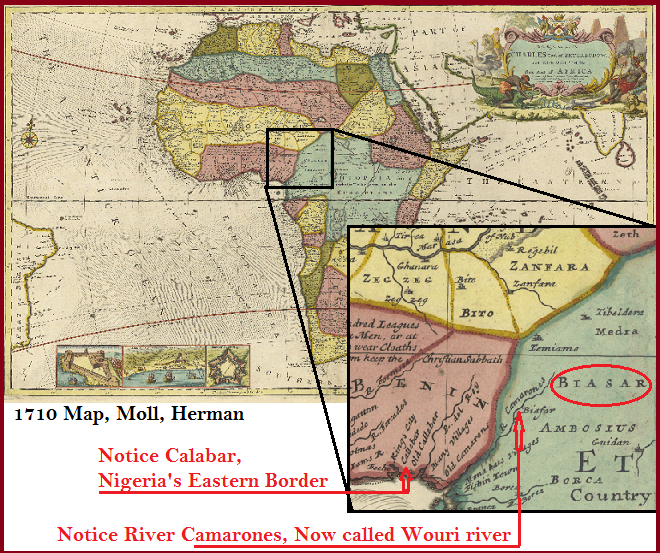 In the image above, River Camarones can be noticed at the left border of “Biafra.” This river, now called Wouri river is in the middle of today’s Cameroon. 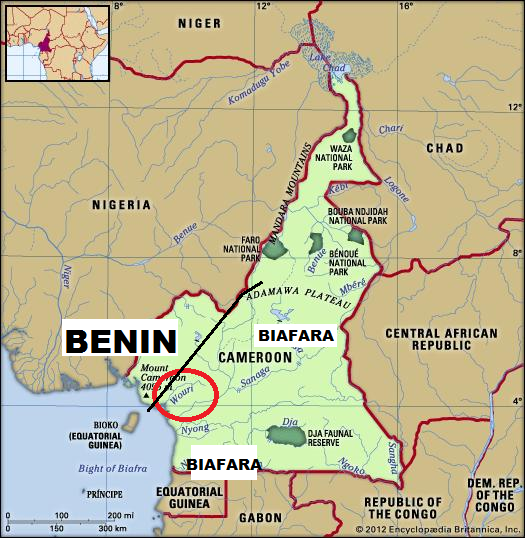 Calabar, Nigeria’s Eastern border is seen well within territory called Benin; Benin, a large demarcated kingdom that extends deep into today’s Cameroon, before the region known as Biafra starts. Based on these findings, “Benin” would serve as a more accurate historical fact based sobriquet for the southern parts of Nigeria in discussion. 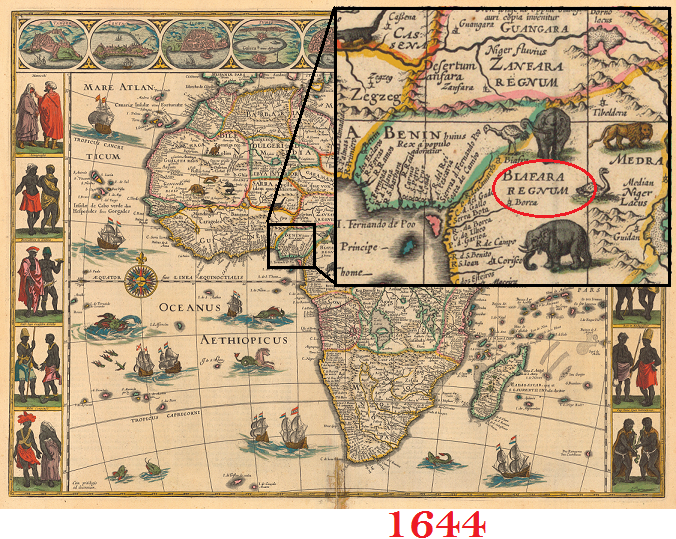 Another map from 1644 also puts “Biafara” solidly in Cameroon, Equatorial Guinea and São Tomé and Príncipe and far from Nigeria’s furthest Eastern border. 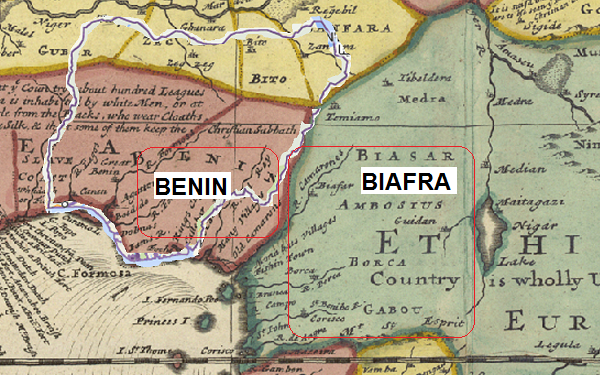 Apparently the prior name of the territory now called Biafra by this group was recognized and mapped as “Benin,” and never Biafra in all historic maps. 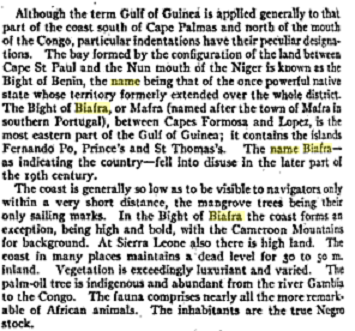 According to Encyclopaedia britannica: a dictionary of arts, sciences …, Volume 11-12, year 1910 , the name “Biafra” from “Bight of Biafra, comes from the word, “Mafra,” a town in Portugal. 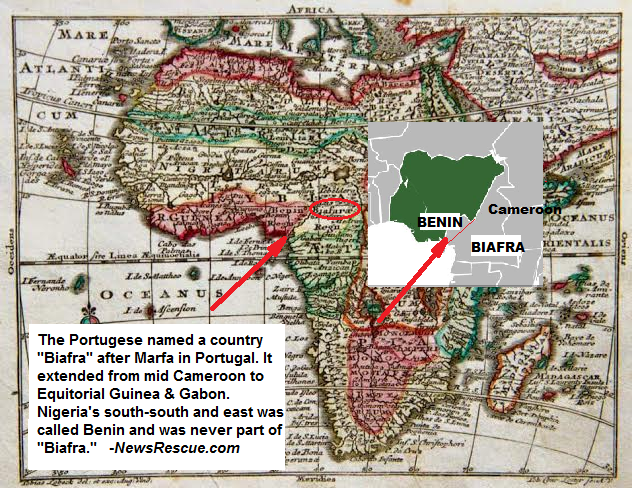 The Portuguese named a country extending from Cameroon southward to Equatorial Guinea, “Biafra,” but the name was later dropped in the later part of the 19th century. The Bight of Biafra, or Mafra (named after the town Mafra in southern Portugal), between Capes Formosa and Lopez, is the most eastern part of the Gulf of Guinea; it contains the islands Fernando Po [Equitorial Guinea], Prince’s and St Thomas’s [São Tomé and Príncipe]. 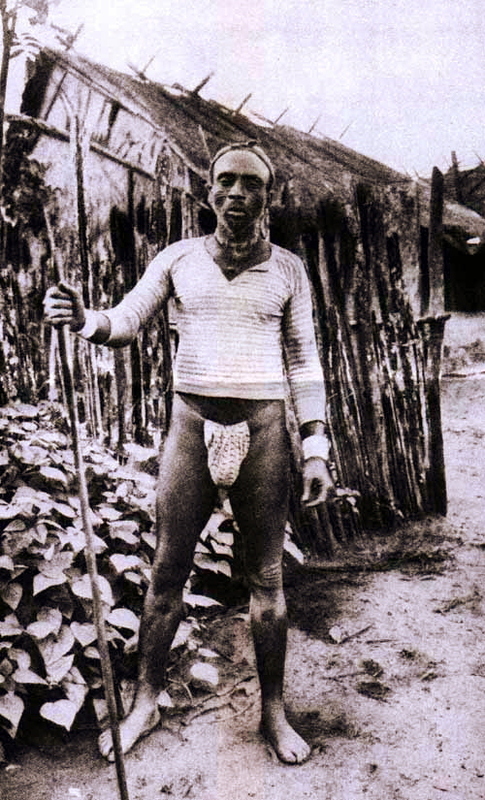 The name Biafra-as indicating the country-fell into disuse in the later part of the 19th century.